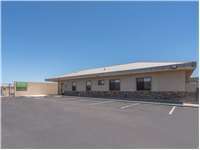 Phoenix Self Storage at 3650 W. Broadway Rd. Located on W. Broadway Rd. near S. 35th Ave., Extra Space Storage serves Phoenix residents near Laveen Village, South Mountain Village, Estrella Village, and Central City. Locals will recognize our facility south of Salt River near Superior Mint Used Cars and Escorpion Auto Wrecking. We're also accessible for residents of nearby apartments, such as Colonia Del Sol Apartments, Vineyard Estates, and Paradise Palms. Extra Space Storage on W, Broadway Rd. has a wide range of storage unit sizes and amenities, including climate-controlled storage, drive-up access, and exceptional security. We're your Phoenix storage solution! Our Phoenix storage facility offers unit sizes from 25 square feet to 300+ square feet, making it easy to find the storage unit that works for you. We also offer units with climate control and convenient drive-up units. Do you have temperature-sensitive items to store? Climate control keeps your unit between 55 and 80°, protecting belongings from extreme heat all year. Pull right up to your storage unit to unload and load heavy items with ease with drive-up access! This feature is perfect for anyone using storage while moving, storing commercial inventory, or in need of a garage-like vehicle storage solution. With electronic gate access and 24-hour video surveillance, customers at our W. Broadway Rd. storage facility can rest assured that their belongings are well-protected. Extra Space Storage goes above and beyond to ensure customers have a positive experience with us. Not only do we provide a clean, secure, and well-maintained facility, but our friendly, professional is also available to help with whatever you need. Contact us today to reserve a storage unit in Phoenix! Great team at this site. Heather and Lauren made the entire process smooth. Thank you to the both of you for a clean and safe site. I hope everyone rents from you. The facility was really nice and accessible. The folks running the place were super helpful getting me set up in the system and into a unit quickly. The staff very friendly. Nice and clean . had no problems in and out. Would highly recommend. And cheap. Love that first month free. Great facility. Well kept grounds, and great customer service. Prices can't be beat. Great staff, excellent access hours as well as the perfect size unit for all our storage needs. Great value for quality storage unit. There system is up to date and easy to use. All managers I have worked with were friendly and able to get things done. Heather was so helpful when it came to my understanding of every little detail. She left no stone unturned and made me feel safe leaving my personal belonging with Extra Space Storage. Everyone was very friendly and informative. Excellent customer service. Best service and customer relations, better then any other storage company around. Great facility. Clean and well organized. Staff is very flexible and helpful. Extra Space Storage is great. The staff is friendly & efficient, the facility is clean. This coupled with their low prices makes this facility one I would highly recommend. Clean facility. Friendly staff. Easy to find. After being with another company it sure is good to be back with Extraspace. Please continue the good work and thank you for focusing on the customer as a good business practice. Congrats! Excellent choice selecting your company. You can't lose with the front desk ladies you have there. Keep up the good work!! This was my first time having to rent storage. This business has Top Notch customer service and Facilities. Highly recommend. Extra Space Storage has great employees great facilities and a wonderful on boarding experience. From this point on I will only choose Extra Space Storage for all my storage unit needs. The facility Supervisor, Heather was Great! Heather was super friendly and knowledgeable. She made the process simple and painless. The premises is very clean and well kept. Very pleased with the overall experience with Extra Space Storage. I am very satisfied with Extra space storage, their customer service is great, grounds and storage units are very clean, i feel like i'm at home when i go to my storage. The staff is very nice and helpful. I was treated with respect and with a smile. And not to mention the prices are great. Drive south on S 35th Ave. Turn right onto W Broadway Rd. Our facility will be immediately on your right. Drive north on S 35th Ave. Turn left onto W Broadway Rd. Our facility will be immediately on your right. Drive west on W Broadway Rd. Our facility will be immediately on your right just after S 35th Ave.
Drive east on W Broadway Rd. Turn right onto S 51st Ave and continue south. Turn left onto W Broadway Rd. Our facility will be on your left just before S 35th Ave.